Siggraph 2006 kicked off today with some great animations and a peek at some emerging art and interactive technologies. In short, Siggraph is a super hub conference of computer graphic animations, interactive techniques, and lots of computer related robotic tools and applications. It’s where technology meets creativity. For a glimpse at what Siggraph has to offer, check out these video briefs: Art Gallery, Emerging Technologies, and computer animations. I watched a bunch of great animations today and had a peek at the galleries. As usual, I was asking a bunch of questions as these kind of conferences are more about what’s possible, rather than whats desirable. More Pics after the jump. I was browsing for some Honest Tea at Wholefoods and stumbled across Inko’s Lychee flavored white tea instead. I’m a sucker for Lychee, hence gravitated towards the bottle, made sure it wasn’t one of those over flavored or sugar saturated ripoffs, then read the rest of the info. Apparently this is the ONLY white ice tea available in the market, which is also one of the most rare tea leaves in the world. There are tons of health bennies you can read about on their webpage, but I’m just going to say this drink rocked! Not to sugary, very crispy, and a delightful satisfying tea flavor with a zest of lychee goodness. Hopefully I can get my hands on a case of these drinks to pass around to friends at my next gathering. Unusual Hotels of the World! Did you ever think those ice hotels in James Bond flicks were real? Well, the answer is yes, and yes for many more unusual adventure-some hotel destinations throughout the world. Would you like to stay in a Cave tonight, perhaps stay up in the trees, better yet closer to the woodpeckers, a popular night in a Freighter Plane, a hotel that you must scuba dive underwater to enter, or would you just like your classic ice hotels. I’ll give the ice and treehouse a try someday, but for now, I’ll stick to the comfy basic rooms that probably suit my budget for the time being, though the polished up fancy ones are always nice to lounge in. Call it a magazine, call it a bottle of water, or just plain call it a refreshing idea in between. “ilove” is the first gossip magazine for women on a bottle of water. Each month several 32 page issues are attached to bottles which allows women a quick update on several topics while they enjoy their beverage….it’s somewhat like a daily blog on a bottle of water. Their hopes are to make these monthly issues weekly, hence, 6+ issues a week, with a version targeting the male audience soon. I’m somewhat skeptical of this idea, but I’ll admit, I was a sucker for those laffy taffy wrapper jokes, those snapple wisdom caps, games on the back of cereal boxes, and those many fun facts and stories on several other food+beverage products. Adding this content might be a nice way to jazz up the value in this competitive world of bottled water, and infact, I’d probably spend a few extra pennies if the content was good, fun, addictive, and useful. Promotionwise, I’m sure they can strike up some other incentives, much like soda cans did with amusement parks ($10 off, when you still have to spend 65$). Anyhow, for sure in this world of time management it’s always great to get snippets of news on the go anywhere! I love it when things in the digital world are brought back into theÂ physical world. There’s the Scroller Scarf, The Mario Brothers Coin Boxes, The Bubble Project quotes, Unnecessary Censorship Shirts, character costumes, the Sims floating diamond, tons of others, and now perhaps my favorite, the Cursor Kite!!! Fly this bad boy over your cityscape and navigate your virtual physical world. It would be cool if you could actually click or drag objects much like that one cursor commercial some years ago, but I’m sure you can easily crash this huge kite into standbys only to knock them over. Perhaps latch on to the tip a fake body and drag them throughout the sky! Anyhow, I love it when the digital meets the physical world…keep them ideas rollin out!! buh yeah! Bong Vodka has just launched a sensational series of artist bottles in collaboration with several artist. These limited edition bottles and graphic boxes will be available towards the end of August in select cities. If you would like to get involved, and perhaps strut your artistic abilities on these beautiful bottles, head over to Spirit Of The Brand and get involved! Their site has a pretty sweet music cast as well. I love it when seemingly ordinary objects get artist involved to spicen up their products to new levels of desirability! Theses bottle are plain beautiful and I’ll be craving to get my hands on them once they come out! I’ve been rockin these recycled yarn MUJI socks for a few weeks now and have to say they are great! In fact, after testing out the first set, I went back to the store and bought another set! My friends have bought up to three sets! They are stylish, comfortable, fun, and colorful. The colors are somewhat odd for some, but thats what makes them fantastic! From a vibrant apple green to a purple haze and a busy blue fuze. If your looking to jazz up your sock collection, head on over to your local MUJI store and get a fresh pair of them…or, get them online here! Here’s a cool project by artist Jonathan Schipper dipicting two cars slowly crashing into each other over the course of a month. There’s also a full sized version yet to be built. This reminds me of Arthur Gansons project “Machine with Concrete” (on display at the MIT Museum) which pushes a piece of concrete an inch or something over the course of a few thousand years, hence, you really can’t see it moving though the gears are cranking right in front of you. I grabbed a pack of gum while waiting in line at Target the other day. I threw it in my bag and thought nothing of it until needed. While picking up a friend for dinner, I whipped out the 12 pack of gum for a quick zest of fresh breath. As I slid the foiled goodness out of the packaging my eyes glazed in confusion and utter surprise; there was no gum in 8 of the 12 foiled slots! I’ve been robbed, ripped off, denied! Did someone pop the gum out and slide the package back in the shelf? In further investigation, the sealed foil was untampered. This was a factory malfunction, a really bad quality control computer or person, or something gone wrong! Anyhow, I thought I’d just share this little experience with ya’ll. 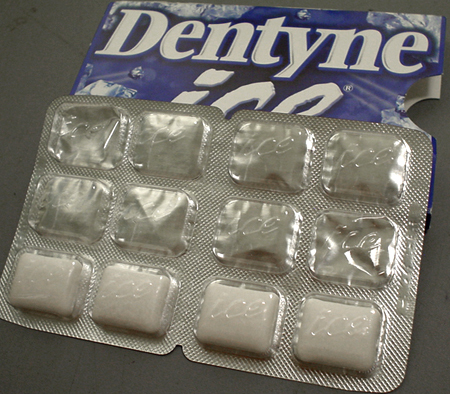 I’ll write Dentyne and see if they’ll send me a years worth of chewies in exchange for this foiled flawed experience. That will make me happy again. This reminds me of some other such food experiences I’ve had, like, the soda with no air in the can, small bag of chips with just 3 chips, an orange mentos in a roll of white mints, a baked in raisin in a 6 pack of muffins, an immensely large M&M in a small pack(was like 9 of them mashed together into one orange stamped one), a ball of sugar in a box of cereal (size of a pinball), a bolt in a box of brownie powder, and now this pack of missing gum. Click on the image for closer look. Update: Dentyne sent me a pack of gum, not the same one I bought, and 2 mints. I was expecting a box of gum or something, but I guess they are cheap in customer service. My phone alarm sounded off this morning and as usual it turned itself off after 30 seconds, while the outside screen still flashed “alarm”. Now I’m not sure about anyone else, but I’d usually just sleep through this or being the sleepyhead that I am, I’d probably just smile in my sleep knowing that the buggy noise would turn off within a few seconds which has happened. Now, I’m not sure who decided to have the sound turn off automatically before I even touched the phone, but from my perspective, this is broken, which also reminds me of a wonderful website, THIS IS BROKEN.com. This is Broken is a website run my Mark Hurst at Good Experience which also runs the awesome GEL Conference (Good Experience Live) which I have attended for the last few years. Everyone should subscribe to their newsletter and blog as well here. One such submission I made to THIS IS BROKEN is pictured above. In short, I went to best buy to buy paper, the only paper was behind this metal column, and I had a hectic time crawling behind the tower to this stack of paper. Read the post and comments about it here. Is it worth the extra price, I’m not sure, but for some fan fanatics, I’m sure it’s a dream. You can hear a sample of the customized song on yahoos webpage which uses the name “Yahoo” which makes for a rather interesting song since “yahoo” also somewhat means, bozo. These new MP3’s are also unrestricted, meaning, anyone can copy them once purchased. (I guess someone can buy all 1000 names and sell them for 50 cents now) Anyhow, the day that you walk into a movie theater, pay an extra 50$ to get a body scan and have James Bond replaced by none other than yourself might be a fun experience. This somewhat reminds me about the post I made about the paradox of choice. Soon when you want to buy a song, you’ll also be asked in what tempo, which remix, which words, which language, which quality, and which pitch. This is very much comparable to how you use to be able to just buy a pair of jeans, though now you are asked, what kind, what length, ripped, stained, washed, buttoned, zippered, etc. I’ll still debate the question if choice is good or bad, but as far as I know, choice is always going to increase. You are currently browsing the weblog archives for July, 2006.